Nestled within an archipelago of volcanic islands, Tortuguero National Park in Costa Rica is known for its rich biodiversity and is home to 11 distinct habitats including mangroves, rain forests, lagoons and beaches. This protected tropical reserve offers visitors the chance to see an incredible array of native Costa Rican plants and wildlife. Your full-day tour begins with pickup at your San Jose hotel, followed by a savory breakfast stop at Rancho Roberto’s restaurant in Guapiles. Continuing on, you’ll pass through the beautiful Braulio Carrillo National Park, a sprawling mountainous reserve dotted with waterfalls and rivers. At a banana plantation near Tortuguero Village, trade in your minivan for a boat, as Tortuguero National Park is only accessible by water. Enjoy a leisurely cruise along the park’s scenic freshwater creeks and lagoons, where you may spot many tropical birds in the surrounding flora. After about an hour, the creeks will open up into a network of broader canals that traverse mangrove swamps and marshy islands. Explore these lush waterways while learning about the park’s history and diverse ecosystems. Keep an eye out for aquatic life like river otters, spectacled caiman and the occasional endangered West Indian manatee, plus surrounding jungle creatures like sloths, capuchin and howler monkeys, and a variety of reptiles. Disembark for a midday lunch at the Evergreen Lodge. Enjoy delicious Costa Rican cuisine in an open-air dining room surrounded by a lovely, lush jungle landscape. After lunch, head back out onto the water to continue exploring the park’s diverse habitats. 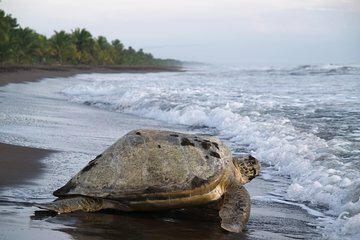 Visit the black sand beaches that provide an important breeding and nesting ground for Costa Rica’s endangered green sea turtles, and learn how the park’s conservation efforts have helped bring this species back from the brink of extinction. After several hours of exploring the park’s beaches and canals, begin the 1-hour boat ride back to the park entrance and your waiting vehicle. Relax and enjoy the passing scenery on the drive back to your San Jose hotel. This tour should not be offered as a one day tour. You spend around 7 hours travelling, and only 4 hours in Tortuguero actually seeing things. The tour departed around 45 minutes late, and there was a lot of traffic. Arrived back to San Jose just after 7pm. You do not see any turtles in February, which was the main selling point for me. It does not state on the itinerary that Feb is the off season. The banana plantation was simply looking at some bananas growing while we drove passed in the bus. When we arrived, we took a boat to the main village, which was nice for around 30 mins weaving through the lush greenery, but then got a bit boring. On the return boat the sailer really struggled to get us back in low tides, in very hot weather. You spend nearly 3 hours in the boat in total, which is far too long! After lunch you are told to just walk around the hotel for 45 mins (this is away from the nice village part) which is a massive waste of time! On the way there, we stopped for 30 mins for breakfast, losing more time, this seems unnecessary and took up time which could have been spent in Tortuguero. Lunch was very nice food. Saw one sloth (at the side of the road), some birds, couple of lizards and iguanas, and a baby crocodile - very limited wildlife. NO TURTLES. We spent 30 mins on the beach, and around 15 mins walking through Tortuguero Village. This was the highlight, and Tortuguero itself seems very nice, relaxed and chilled, a little bit touristy, but less so compared to places like Manuel Antonio, Monteverde and La Fortuna. I wish I would have booked an overnight stay, as I feel it was needed to appreciate the place. The tour guide also speaks multiple languages, which is fine, but means everything is told in Spanish and English, so you miss out on hearing more. I would not recommend booking this trip as the one day offering from San Jose (certainly not in February). Book it yourself and spend at least one night there. Very interesting visit to the Caribbean side of the country. Amazing, saw lots of wildlife. Knowledgable tour guides. Nice lunch. This is a great place to spend the day and we had the most awesome guide - German sounds like Herman. He showed us so many things, was extremely knowledgeable about Costa Rica and just seemed to enjoy spending the day with the group. This tour shows the beauty and richness of Costa Rica's nature. A trip on a minivan, then on a motor boat, a walk in the park make this long trip not very tedious. The childhood memories from Jules Verne's books came to mind when they sailed along a narrow, winding river through a magnificent jungle. It should be borne in mind that turtles can be seen only at certain times of the year, we did not see them, but without them there were many interesting things. It was a very disappointing experience. First of all, this tour was supposed to be in English. Our group included two people who spoke only Spanish and the rest of the group spoke English. The guide, whose native language is Spanish, did approximately 80 of the talking in Spanish. He didn't always wait until the entire group assembled to begin talking, so we missed much of the information. Secondly, this trip is very long - it lasts 12 hours. We did not want it to be any longer, but this wasn't the case. The guide was in such a hurry to get there, but didn't seem to mind wasting time at other places. On the way to the river the bus picked up some other people who weren't on the tour. On the way we also stopped at an ATM and wasted at least half an hour just parked there. After lunch, we were supposed to have a boat ride on the river: the main attraction of the entire tour. We waited for our boat to arrive for at least an hour in a gazebo with no entertainment other than each other and our devices didn't work with bad WiFi. When the boat finally arrived, there were several people already on it. It appeared that those people should not have been there. Thus, we sat in the boat in the middle of the river for another hour in the blazing hot sun and 95 degree weather while our guide tried calling everybody to figure out what happened and what to do with the extra passengers. We wasted two hours for nothing and come back. The jungle trip was discarded since we had to return to the bus. At the end we returned two hours late: after 8:00pm rather than 5:30 as promised. There was a complete lack of cooperation and disrespect towards the group. It is truly unfortunate that we wasted our day and a lot of money on this trip: it was an absolute disaster. We would definitely NOT recommend this to other travelers- find a different tour. Excellent. Very enjoyable. The bus was comfortable and air-conditioned. This was an early start with breakfast before heading to boats then a long boat ride following by a walk around the village. We then had lunch in a restaurant inside the forest then another boat trip back to the bus. We loved our trip to Tortuguero National Park. Our guide, Luis, did a great job making every part of the trip informative and entertaining with jokes or facts about the location we were in. We saw some amazing animals on our boat ride too - definitely worth the price and a great experience overall. The one-day tour came up short of my expectations and I can not recommend it to anyone interested in actually seeing and spending some quality time in the park. We left our hotel about 05:30 and spent the first 1.5 hours traveling around San Jose picking up other tour group members. Stopped along the way for a typical CR breakfast about 1.5 hours from SJ and then traveled another 2 hours to the drop-off point for our boat ride down the river. The ride was very nice although not focused on photographing sights along the way. It seemed like the boat ride was meant to get us to beach area and then back to the tour bus as quickly as possible. Most tourists want to take home photographs of the sights and the rush to get from one location to another wasn't conducive to taking good photos. Neither the guide nor the boatman seemed aware that taking photos while facing the sun results in poor quality photos compared to those taken with the sun at your back. As I said, the boat ride was very nice and it could have been much better if more time was spent viewing the sights along the river and less time traveling to and from the park. If you decide to do this trip, opt for 2 days to give yourself time to actually see the park.